Cid Style File: Sassy City Chicks Love to Shop! This holiday season is soon upon us and you know what that means...SHOPPING! I attended this event back in the spring and had a blast. Now its your turn to come join me in the fun! 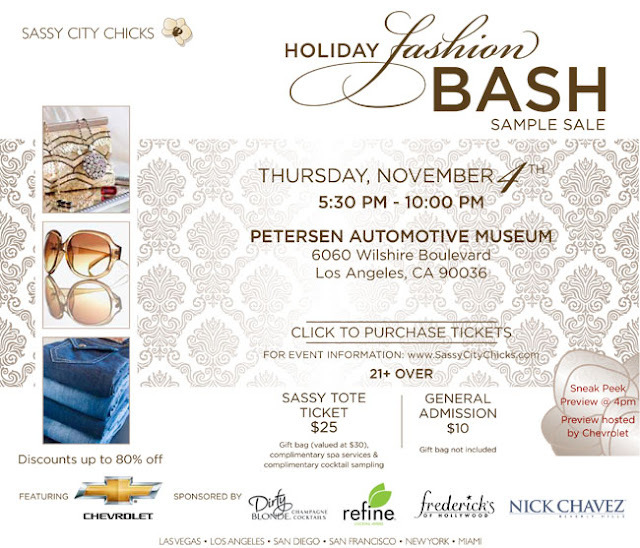 Get ready Los Angeles: last spring’s Sassy City Chicks Fashion Bash was such a wild success, the show will return to the Peterson Automotive Museum for a holiday shopathon! Savvy shoppers should take advantage of discounted designer goods, and score some cute cocktail attire or of-the-moment jewelry just in time for holiday parties. (With prices marked from 30-80% off, you might as well find a few early Christmas or Hanukkah gifts for mom too!) Event participant Chevrolet will bring back its celebrated “Ride ‘N Drive” program, where shoppers can test drive shiny new vehicles and receive special gifts for revving up! With a DJ providing Gaga-worthy jams, guests can take a dance break between booths and sample a complimentary cocktail as well. The signature Sassy Spa Lounge will also return as one of the most sought-after spaces on the show floor, featuring courtesy mini treatments from a selection of LA’s hottest salons. WIN FREE TICKETS! The first 25 shoppers to enter 'CIDSTYLE' at checkout will receive a FREE Sassy Tote Ticket! (Value $40). Click here for Tickets! Don't want to risk not winning? Then enter 'LA12' at checkout for 50% off a Sassy Tote Ticket or GEN AD for free general admission (gift bag not included). WHAT: Designer clothing at discounted prices, complimentary cocktails, free spa services, fantastic gift bags, and fast cars! Event participant Chevrolet will be in attendance with trunk shows being featured out of specialty Chevrolet vehicles.